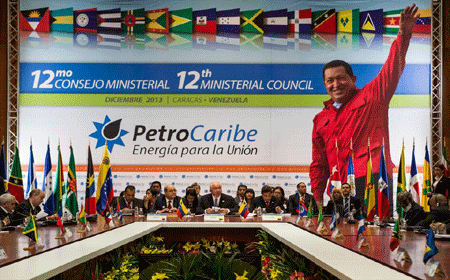 PetroCaribe halcyon days are gone! BELIZE CITY, Mon. Dec. 7, 2015–With Venezuela’s Opposition gaining a supermajority of seats in that country’s legislature following Sunday’s election, it is believed that the political outcome also marks an end to socialist rule in that country and possibly drastic alterations in the PetroCaribe program under which countries such as Belize have accessed long-term concessionary financing while buying fuel from Venezuela on credit. Speaking with journalists on Friday, Finance Minister and Prime Minister, Hon. Dean Barrow said that whether the program continues or not, future inflows would be primarily earmarked to settle compensation due from the Government for shares it appropriated when it nationalized the two utility companies: Belize Telemedia Limited (BTL) and Belize Electricity Limited (BEL). “Even if the program continues, the fact that the flows are greatly reduced, doesn’t appear to be likely to change anytime soon,” he told journalists outside the National Assembly, where Parliament had met for the first business session since Barrow’s party, the United Democratic Party, won a historic, consecutive third term. The main item on that agenda was $44.7 million in PetroCaribe spending for the months October to December 2015, of which roughly 10% went toward flood relief, primarily for Belize City, impacted by flooding in October. In January, the new Venezuela legislature, which will be comprised of a supermajority of 113 members from a coalition made up of 109 persons from the opposition party there, will assume office. There are a total of 169 seats in the legislature. In Friday’s sitting of Parliament, it was noted that the PetroCaribe funds are not free money, but money that Belizeans will have to repay. Under the current arrangement with Venezuela, Belize has a repayment plan spread over 25 years. However, Belize has already experienced changes in the supply of fuel from Venezuela, starting earlier this year, when that country discontinued the shipment of premium gasoline to Belize. The changes follow the demise of former Venezuelan president, Hugo Chavez, the founder of the PetroCaribe program, who died in 2013. If Venezuela implements further changes, or cutbacks to the supply of fuel to Belize, it will directly affect the availability of funds to the Government of Belize. Barrow pointed to a bill laid before Parliament on Friday to raise the threshold on treasury notes and treasury bills so that Government could meet its debt obligations by raising further funds on the domestic market. He said, though, that to the extent that the PetroCaribe funds are available, they would help the Government to meet compensation payments, and that will be the first call on any PetroCaribe flows to Belize in the future. Earlier this year, the Barrow administration reached a settlement with both utility companies which could see the Government paying out in excess of BZ$230 million to the former owners of Belize Telemedia Limited and Belize Electricity Limited.